Description: Buying a gun safe is essential for any gun owner. Not only does it keep your firearm away from children and intruders, but it also serves as protection from water, fire, and dirt. We all should keep a gun safe in our house and if you are looking for the best safe, read our gun safe reviews list and get maximum value for your money. 13 What to Look for in a Gun Safe? I know how difficult it is to select a gun safe, and that is why I picked out 10 of the best you can buy. In this guide, I have included as many pertinent details as possible, and there are other pieces of information here about gun safes in general. 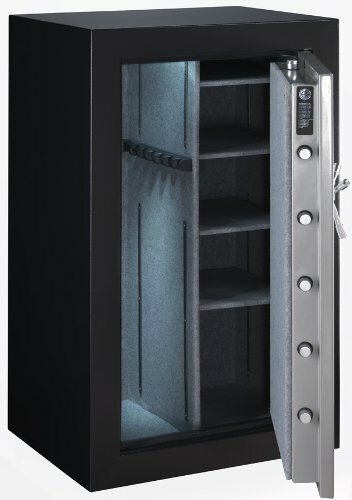 This safe uses proprietary Barska biometric technology to store up to 30 unique individuals. It only takes moments to record fingerprints and once set, those are authorized to quickly open the safe. Its use of biometric technology eliminates the need to memorize long numeric passwords. The numbers can be hard to recall if you’re under stress, so it is more convenient to just use your fingerprint to open the gun safe. 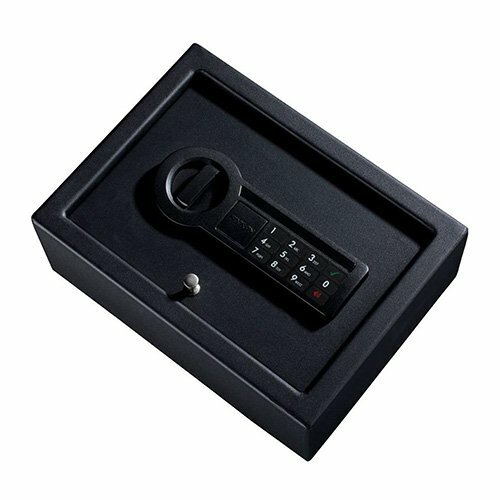 In addition to the biometrics, the safe also has a heavy duty 2 point deadbolt locking mechanism to enhance security. If you like the gun safes the old fashioned way, no need to worry since there are two backup keys. With a lot of options, you can secure your pistols and other valuables the way you want. The safe itself is made of heavy-duty steel so it should hold up to long-term use. The safe has room for two to three 9 mm handguns. You can also put ammo boxes at 100 rounds per box, 8 clips, your wallet, and a few more small items. While the Barska was built for gun storage, you can also use it to store other valuables like documents, jewelry, etc. At just 16.5 by 7.75 by 14.5 inches, you can place the safe anywhere in your home. The safe runs on 4 AA batteries which are included and they usually last up to 2 years. All the required mounting hardware are included as well. 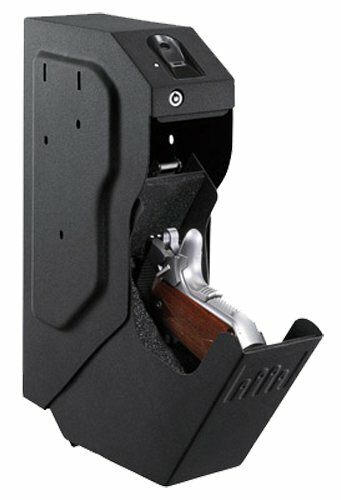 The Barska biometric safe is well designed, durable and provides excellent storage and protection for your pistols. While easy to program and use, the locking mechanism keeps intruders at bay. We have also an in-depth review of barska biometric safe. The PDS 1500 is equipped with 2 live action bots for greater security for your gun. At (W x D x H):12 x 8.75 x 4.5 it is also tiny enough to fit in a drawer for quick access. The hinges have also been concealed to deter prying. The PDS 1500 also has a timeout that triggers if you enter three incorrect combinations in a row. This is a nice safety feature that keeps burglars and the curious from repeatedly trying to open the box. The gun safe has a programmable electronic lock that makes securing easy. Even if you’re a new one to gun safes, it won’t take long to figure out how it works. Look closely at the safe and you will see pre-drilled holes so you can mount this quickly. The safe has a roomy interior so you can store pistols, documents, jewelry, and other valuable items. The portable structure also means you can use the safe at home, in your car or keep it at the office. The PDS 1500 also has room for lots of ammo, and the construction design also acts as a deterrent to anyone who may want to tamper with it. The plate is solid and the steel is resistant to prying as well. The keypad beeping can be turned on or off, and changing the combination is easy. As far as electronic safety locks go, the PDS 1500 is one of the better ones I’ve come across. It is well built and provides a nice balance between security and making sure your kids can’t open the safe. 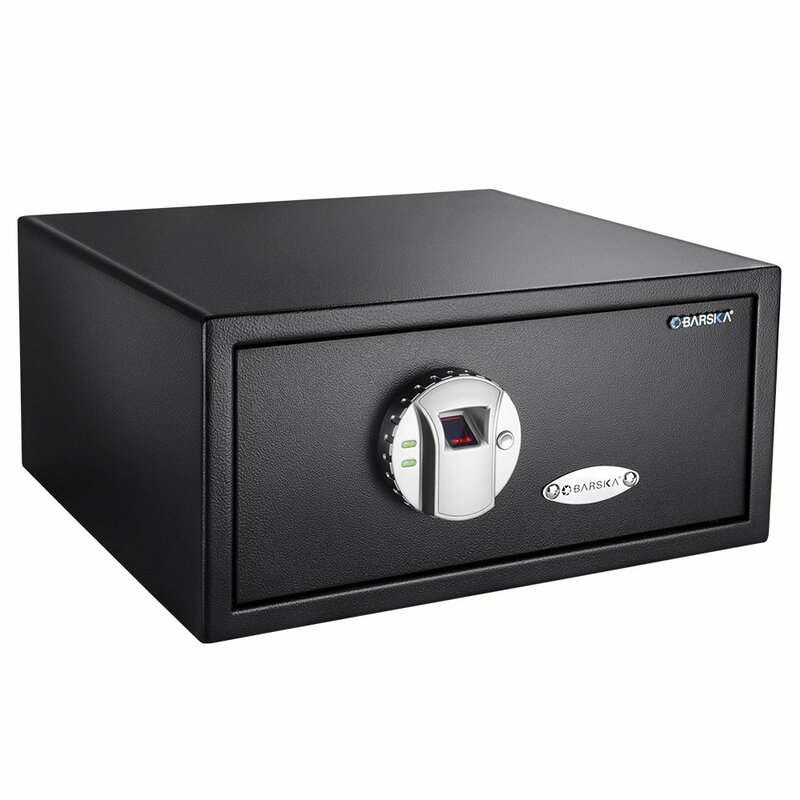 If you want to know more about this safe, you can read Stack-On PDS-1500 review. The SentrySafe was built to protect your firearm, and at the same time to prevent unauthorized use. 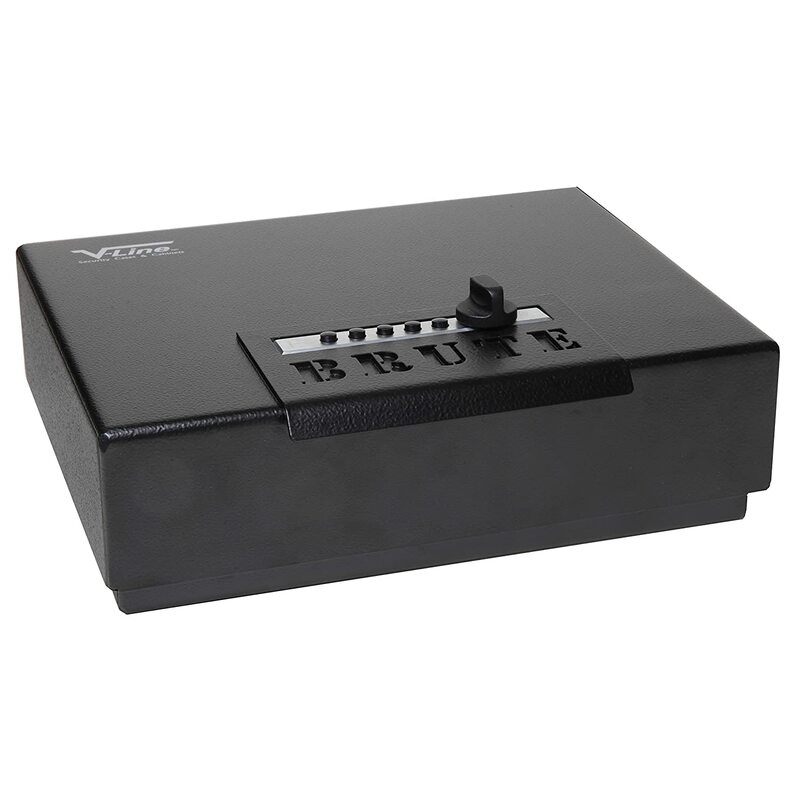 The safe uses the latest biometric technology for easy programming. By using your fingerprint, the safe opens quicker than a typical combination lock. The SentrySafe uses a compression gas strut so the safe opens quickly and quietly. In case there’s a break in, you can quietly open the safe without alerting the intruder. This also allows for one-handed opening. Going back to its biometric technology, it allows you to store up to 4 fingerprints for enhanced protection and shared access. At the same time, this also limits access to only those that you have authorized. The safe also has an override key and electronic lock for backup access. The keypad has zero feedback so you’ll be able to punch in entries without making a sound. The gun safe is made of solid steel and the door is pry resistant. Even if somebody were to try and pry it open, the safe will not budge. The SentrySafe does not have any anchors, but you can mount it via the pre-drilled holes for your convenience. Bolting the gun safe is easy and you can use to store various types of items besides guns. Once set up, the safe response immediately to your touch, great for emergencies. 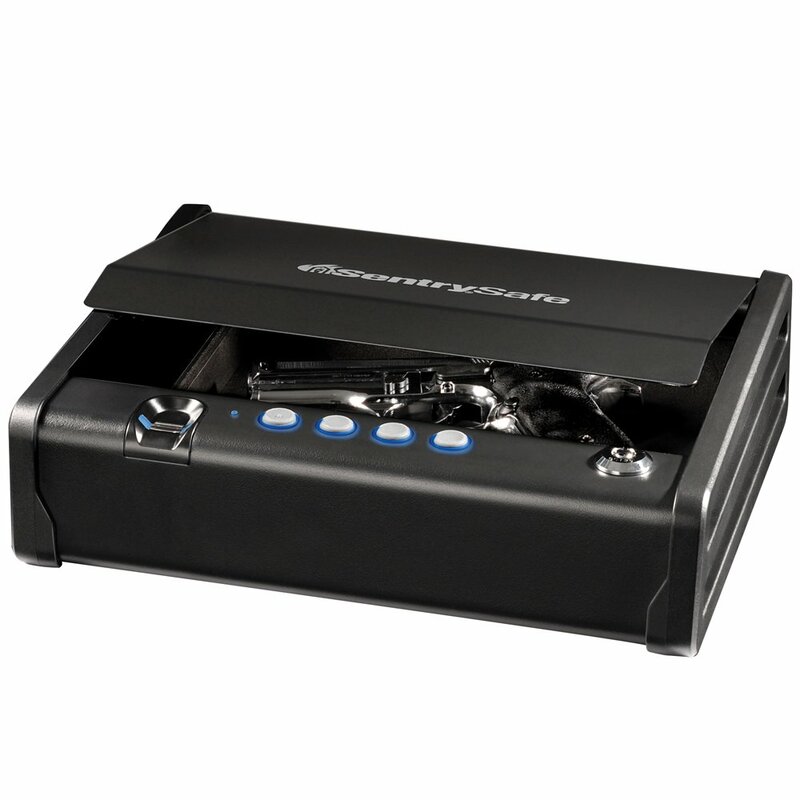 The SentrySafe Quick Access gun safe is of exceptional quality. It is ideal for single gun storage, and it is also easy to program and use. While it faces a lot of competition, the safe manages to hold its own. To learn more read Sentry Safe qap1be review. The SVB500 resembles a pistol holster, but this one has a safety lock and a drop-down drawer for easy access. You can also mount the safe on a wall, your desk or just about anywhere you want. The safe is made from heavy-duty materials so it will last a long time. There is also an interior LED light so you can retrieve your gun in case of an emergency. The keypad also has a silent mode so it doesn’t make any sound when you enter the keys. The gun safe has a solid feel to it, and the portable design means you can store it anywhere you want. Mounting the gun vault is easy so this is ideal for home or the workplace. There is also an option to turn the beep off if you want. The combination is simple to figure out, and there is foam inside to protect your gun. The foam is not removable, but that is actually a good thing so you don’t accidentally take it out as well. Aside from your pistol, there is enough space here to secure for some magazines. This only goes to show this gun safe is versatile and well suited for the responsible gun owner. Overall it is solidly made. The SVB500 is one of the better gun safes that GunVault has made in recent years. It is not just aesthetically pleasing but also makes access easy. If you’re looking for a gun safe that is easy to access and stored anywhere, the SVB500 is a good choice. To know more about this item, the gunvault speedvault sv500 gun safe review. With a name like Fort Knox you’d expect a heavy duty, durable, dependable gun safe, and that is exactly what you get here. 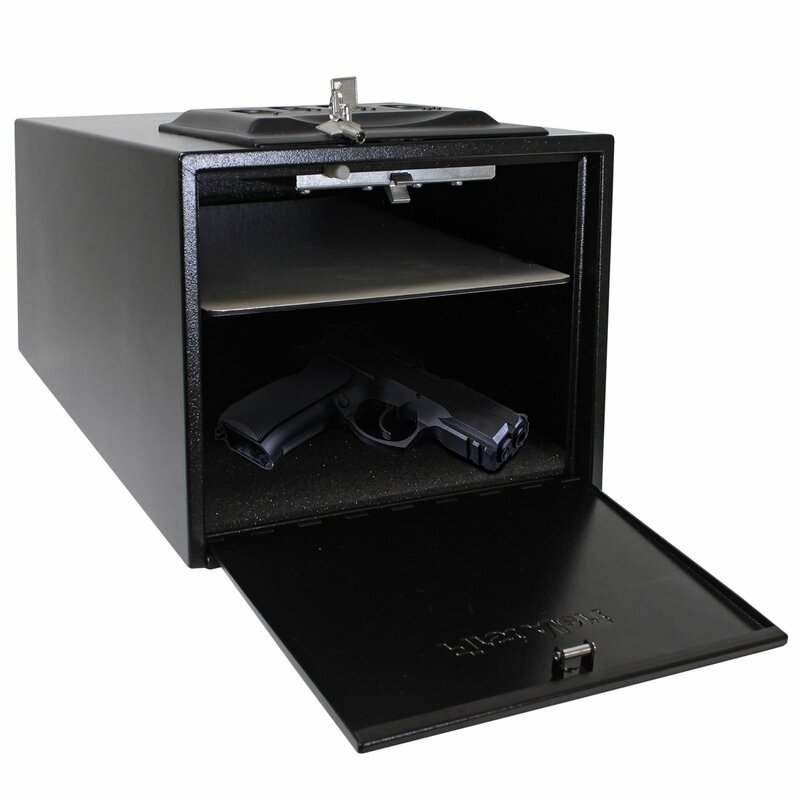 The FTK-PN is a versatile gun safe that you can use at home, your car or the office. With 1081 possible combinations, a burglar or child will have a hard time trying to get into the safe. However, if you have the combination the safe can be easily opened in case of an emergency. The gun safe is made of solid steel so it won’t get damaged by prying. Another advantage is the safe does not need any batteries. This means you’ll be able to use this without having to buy replacement batteries. The hinges are spring assisted so it responds quickly when you open it. Available in different sizes, the gun safe is also made from 10 gauge steel and has a lifetime warranty to boot. What really makes the FTK-PN a quality safe is you can use it in different ways. You could, for instance, store documents, jewelry, and other valuables. And because it has a lifetime warranty you don’t have to worry about the unit breaking down. 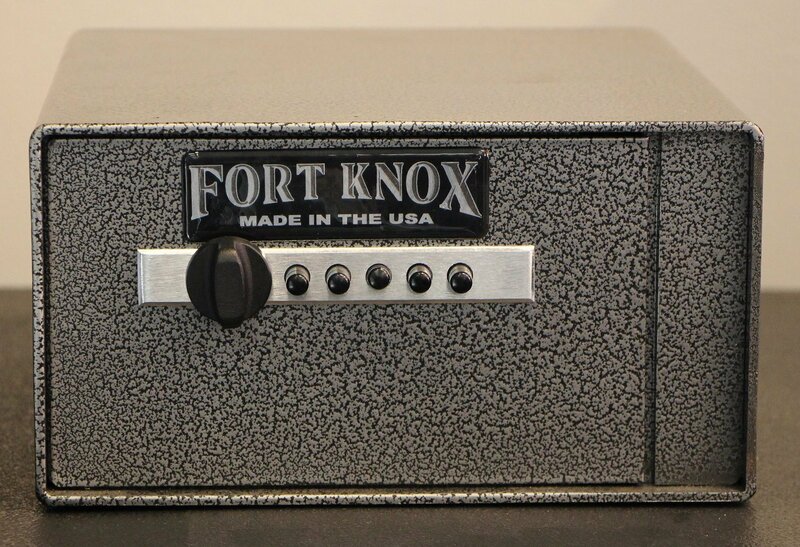 A lot of gun safes claim to be heavy duty, but few are as solid as Fort Knox. For your pistols or other belongings, it is the ideal safe. Some people travel with their handguns, and they don’t want to do without the added security offered by a portable gun safe. This particular model certainly qualifies, as it is designed to fit inside a desk drawer, in a closet, or even in a vehicle. This can be mounted in place as well, should you have a place where you wish to place it more permanently. This means that despite its light weight and compact nature, a thief can’t just pick it up and leave. The exterior measures just 11.75″ Long X 8.75″ Wide X 4.5″ Deep, and it only weighs 13 pounds. To open this, you just press the numbers on the digital entry and you’re in. It only needs 3 to 6 digits, so it’s not really hard to remember the number you use. If you do forget, you have backup keys which also work great if ever the electronic lock won’t open because the battery has run out. Inside, the dimensions measure 1.5″ Long, 8.5″ Wide, and 2.5″ Deep. The inside has carpet mat padding to protect your items, should you instead choose to use this for your expensive wristwatches. 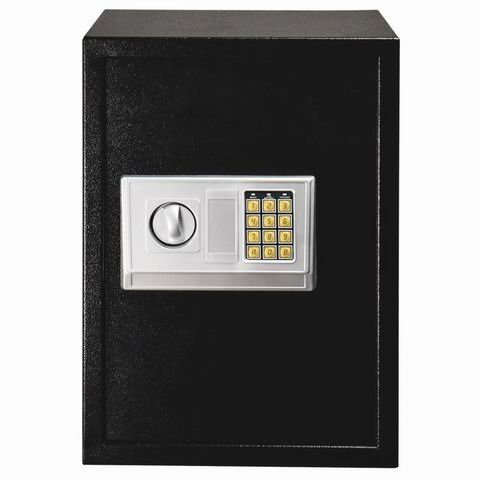 The safe is made of 1/8″-inch solid steel with tamper-proof hinges. Despite its lightweight, it’s actually tough. It’s also designed to last for a long while, which explains the 10-year warranty. It seems to fit just about anywhere, whether you’re home, in your office, or in your car. It’s very light, so it’s easy to bring with you. The lock mechanism offers electronic PIN and key options. The 4 AA batteries you need are included. The steel is quite thick and very solid. You have predrilled holes and bolts to anchor it in place. You will want to be careful with the plastic knob. This is meant as a portable model so that you still have a gun safe even when you travel. So it works best as a backup gun safe, or as a safe which you can install in your vehicle. This is a fabulous safe but probably not the best handgun safe. Let’s start with the fact that this uses 10-gauge steel, which is the level of steel quality you need for a gun safe. In addition, it uses all steel parts, so there are no plastic components that can fail along the way. This includes the clutch knob that can turn 360 degrees and which simply won’t break. This uses a mechanical lock, which makes things easier and more basic to open and secure. It also uses a clamshell design for anti-prying protection. The lids are oversized with close tolerances so that it can’t be pried open on any side. The lock block is also made of extra-large solid steel, while the extra-heavy-duty hinge is welded on both ends. For additional protection, the handle surrounds the lock faceplate which works against prying as well. The inside measures 12 x 9 x 3.25″ which can fit in 2 full-sized pistols with its foam interior. The outside measures 12.5 x 9.5 x 3.6″ and with its 20-pound weight, you can transport it easily enough. It even has a handle. But you can also secure it in place with its 4 predrilled holes for mounting. The quality is excellent, and it’s not a coincidence that it is made in the Simi Valley instead of some foreign place where quality control is substandard. This is even CA DOJ-approved, so you know that it complies with necessary gun safe standards. This is a reliable gun safe that won’t have any plastic or electronic parts that can fail. The quality is very high, and it’s fairly easy to transport as well. Put your pair of pistols here and you can access them very quickly when you need to. The First Alert brand has been around for the last 60 years or so, and so it’s safe to say they’ve learned quite a bit over the years. Though this uses 16-gauge steel, it’s still tough enough to warrant the approval from the California DOJ. This utilizes a no see keypad so that you can discreetly open the lock with a passcode of 3 to 8 digits. It uses a pair of AA batteries, but if they fail you can always use one of your 2 emergency override keys. The inside measures 9.8 by 13.8 by 7.8 inches, and it has a removable shelf so you can have a separate compartment for your ammo or for other items. 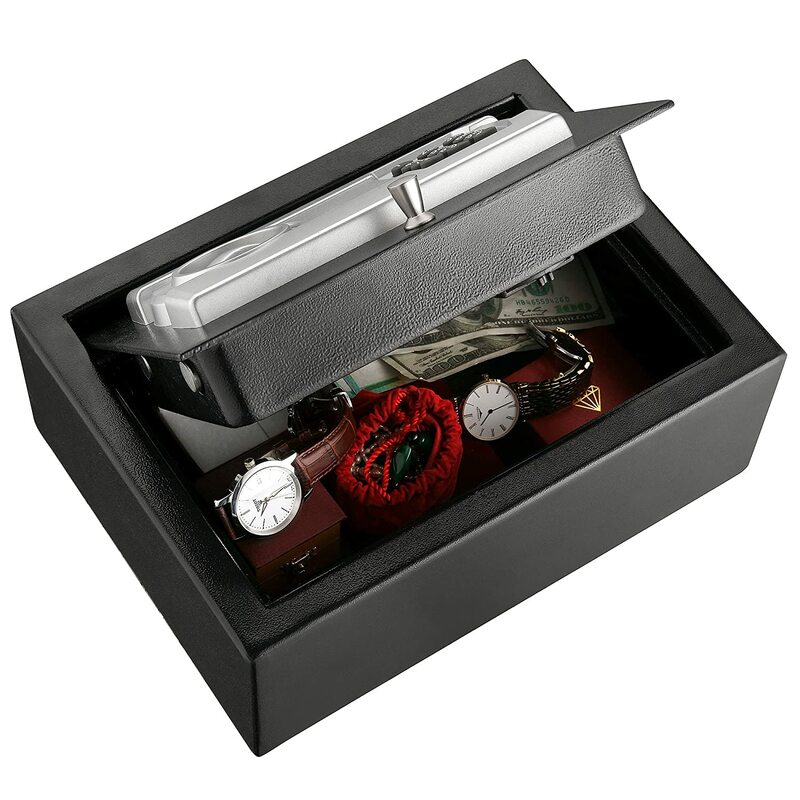 The interior is padded with foam to protect your items as well if you travel with this safe. This can be bolted in and it already has predrilled holes. You can even secure this to the trunk of your car as it comes with a 1,500-pound test steel cable. But if you travel with this, it’s not heavy at just 15 pounds. This offers an easy way for you to access your guns quickly and discreetly when you need them. It has enough space for 2 guns, and you only soft noises instead of loud beeps. Now, this looks like a heavy-duty safe, and it’s large as well. It measures 13″D x 14″ W x 23″ H on the outside, and 3.5″ x 11″ x 19.5″ on the inside. This is big enough to accommodate a pistol as well as official documents and valuables. It can even fit in a laptop. This comes with a magnetic lock that automatically locks the safe. You can open it with your digital code or with your safety key override. If you fail to put in the right code in 3 attempts, you’ll get a timeout period. The lock uses 4 AA batteries, and these batteries are expected to work up to 3,000 times of opening the lock. This can be bolted into a wall, cabinet or floor, and it has 4 predrilled holes. It’s quite heavy at 73 pounds, but it also has 4 wheels so you can move it to where you want it. This is basically deterrence for casual thieves and kids who want to play with your guns. There is enough space to store in a wide variety of items, and it can be used for even medications or liquor. It has a shelf inside that you can remove to accommodate certain shapes and sizes. If you are looking for something large and solid, this gun safe is the one. Besides, it has 4 wheels so that you can move it anywhere anytime without any trouble. There may be a time when you don’t want to turn on the bedroom lights when you open your safe or a cabinet. It can be a hassle trying to remember to use a flashlight too. So you should get a safe or a cabinet that comes with interior lights, but not all of them do. That’s no longer a big deal, as you can install these lights instead. This gives you 3 light heads with 3 LED lights each, so you can be very sure you can see inside. The light heads even pivot. These lights are battery operated, and they turn on automatically when the door of the cabinet or safe is opened. You may also opt to turn on the lights manually, and there are 2 levels of brightness. Installation is a breeze, as you can use either the mounting plate or the hook & eye tape. Both options are included in the purchase. This is easy to use and install and buying one may lead to you buy more for all your cabinets. They’re seriously useful, and for the price they’re great. Say goodbye to dark safes and cabinets, when the room lights won’t let you see inside more clearly. Once you get one of these, it’s hard to resist the temptation of getting one for all your cabinets and safes. Most if not all states require gun owners to take responsibility for owning pistols. A gun safe is one of the best ways to secure it. A gun safe provides protection from dirt, water, dust and in some cases fire. If you have kids in the house, a gun safe reduces the possibility of them getting access to it. California and other states have a law requiring gun owners to store their firearms when not in use. A gun safe is the most practical way of following this rule. A gun safe allows for quick access. With a biometric safe, a tap lifts the lid and you can grab your pistol in case of an emergency. A gun safe can be mounted on the floor, wall, desk or anywhere you want. You can take the safe in your car or have it installed at your workplace too. Most insurance companies only provide cover for about $3000 worth of firearms. If your insurance doesn’t cover them, a gun safe offers the best protection. You can use a gun safe to store other valuables besides your pistols. Many people use them to store documents and cash for instance. There a lot of different gun safes to choose from. Some are for a single pistol, others for 2 and 3, it’s up to you. The bottom line is a gun safe brings a lot to the table, and it is something every gun owner ought to have. To know more, visit the Tips page. What to Look for in a Gun Safe? So now you’ve finally decided to buy a gun safe, but the question is what features should you look for? Here are some suggestions and reminders to keep in mind. How many guns do you have, and do you plan to buy any more soon? Don’t buy a gun safe without taking stock of the number of guns you own and their sizes. Consider the gun safe’s interior dimensions too. While gun safe A and gun safe B may be both designed for one pistol storage, one may be larger than the other. What it comes down to is this: buy the right gun safe size for the number of handguns you own. Get a bigger gun safe if you’re going to store documents and other valuables. In case there is a burglar in the house, can you open the safe immediately? Do you need to enter a long combination or does it have biometric technology? Is there a backup key available? While you want the gun safe to be accessible and you don’t want it too accessible that anyone in your home can open it. This is where the locking mechanism comes into play. A secure locking mechanism is not going to do a lot of good if the rest of the safe is poorly built. That is why you need to look for a gun safe that is made of solid steel, one that can withstand prying and attempts at breaking in. The level of security a gun safe provides depends largely on the quality of the steel. Fortunately, it’s pretty easy to compare the quality of one type of steel with another. This isn’t really subjective, as you can compare steel quality in plenty of object ways. One main factor to consider here is the thickness of the steel. Sometimes this is expressed in inches, and that’s fairly straightforward enough. But this may also be expressed in gauges, and here you want smaller numbers. The thinner the metal is, the larger the gauge number you’ll find. Here’s a handy cheat sheet to help you find out how thick the metal is when you encounter a gauge figure. For a gun safe, the minimum thickness is set at the 10-gauge level, and this is 0.1345 of an inch. The door should be thicker than the body in general since it’s often the area that many would-be thieves will attack. Do not be lulled into thinking that a metal side that seems thick when you look at it is actually solid metal. That just may mean that you have a pair of very thin sheets of metal sandwiching a thick layer of fire-resistant material acting as a fire barrier. Finally, you have to check out how the steel parts are all put together. It’s best if you have full continuous welding for all the steel parts, instead of spot welds or bolts. The full continuous welding offers great protection against both thieves and fire, so it’s all good. It’s annoying that it’s not as easy to figure out how actually fire-resistant a gun safe is. Good brands for gun safes do test their materials to truly find out how long a gun safe will last for a certain temperature level. To do this, these manufacturers contact independent testing companies to put their gun safes to the flames while they also check the conditions inside while the testing goes on. The problem is that these testing companies do not have a standard test regarding gun safes, so they all have their own ways of testing gun safes. So in other words, you’re left with an apples and oranges situation when you can’t really make a head-to-head comparison. A huge number of these testing companies (and gun safe makers) may be trustworthy, but the uncertainty still exists. So the question is are gun safes really fire resistant? A realistic fire scenario may take an entire hour for your house to burn to the ground, and the flames can reach temperatures of up to 1300 degrees F. However, in most case’s it only takes about 15 minutes for firefighters to arrive after they’ve been alerted so that most fires are subdued well before the hour passes. A good starting point is to check that the manufacturer certifies that the interior temperature of a gun safe will not exceed 350 degrees F for at least an hour. These manufacturers may also specify how long their gun safe will last against temperatures that exceed 1300 F.
A basic gun safe may not really need fire protection, as you may only want to keep your guns away from your kids. But when you wish to upgrade, it’s the next level of protection you need for your gun safe. A well-designed gun safe should have a solid feel as it is made of durable materials. If you’re going to leave the safe in one spot, the heavier the better. But if you’re going to take it with you on the road, a lighter gun safe is ideal. Some safes only provide lock protection, while others are fire resistant. Only you can decide how much protection is necessary for your firearms. Some gun safes have alarms built in for extra protection, while others have a timeout feature that kicks when a certain number of incorrect entries are entered. The more safety precautions built in the better. Keep in mind also that some gun safes need batteries to run. These batteries may or may not be included, but the good news is these safes manage battery life as well. Use the gun safe only as directed. Wipe the fingerprint sensors after you have recorded yours. A gun safe dehumidifier is a good idea especially if you don’t expect to use the gun for a while. Make sure to provide access only to those you trust. Take out the items in the safe every now and then to let them breathe. Wipe the safe to keep dust and dirt from settling in. Always have batteries in reserve. Never buy an electronic gun safe unless there is an override key, just in case the electronics fail to work. Clean your guns regularly, as a gun safe won’t do it for you. This is the most common lock. While it may take a bit of time to open, these are very reliable. Gun safes that use mechanical locks have a key for locking the dial so it won’t spin. Electronic locks are faster to open than mechanical locks. The technology has also improved a lot over the years. These also remember the combination so if the battery dies, just pop in a new one. These are often used for large gun cabinets than small gun safes. While these offer some kind of protection, they’re nowhere near as effective as the other locks mentioned here. This gun safe uses your fingerprints to lock the unit. It is fast, efficient and you can store several fingerprints to grant access to different users. These usually have other locks built in. Buy only from companies that have established a solid reputation for making quality gun safes. Names like Barska, SentrySafe, Fort Knox, GunVault, and Stack-On are good choices. Q: How big should my gun safe be? A: Buy one that is larger than what you think you’ll need. It is better to have a bigger gun safe than a smaller one. Q: How are gun safe steel thicknesses measured? A: Steel is measured in gauges, and the higher the number, the thinner the steel. So if you want durability, look for a gun safe with a low gauge number. Q: What are the most commonly used steel gauges in gun safes? A: Most gun safes use 14 to 1 gauge, while for gun safe doors it is 14 to 1.5. The thicker the steel, the heavier the gun safe. Q: Do more locking bolts mean better security? A: The objective of the bolts is to keep the safe secure when someone uses a crowbar to break it open. The thicker, the longer and the more bolts are for the better security. However, if the door is made of light steel, the bolts won’t make much of a difference. Q: Which is better, electronic or mechanical locks? A: Everyone has their own preference, but for ease of use and accessibility in the event of an emergency, electronic locks are better. Q: What is the difference between UL and ETL testing? A: ETL and UL are both used to determine the durability of a gun safe. However, the UL adds a drop of 28 feet to the test. So between the two, UL is more comprehensive. Q: Which is better, internal or external hinges on a gun safe? A: It does not make a difference as the safe’s overall quality is more important. I hope the information in this guide was of some assistance to you. I know how difficult it can be to pick out the right product especially when it comes to gun safes. There are a lot of options to choose from, and it is impractical to read thousands of products online. By selecting the top 5 here, and including other information about gun safes, you are now better informed when it comes to buying. So if you’re new to gun ownership, these gun safe reviews will surely help to find one that suits your needs.